Pro-Tek™ brings sustainable and environmentally safe products to homeowners and small businesses across the nation. Their goal is to promote a more natural existence through cruelty-free, vegan, non-GMO products. Pro-Tek’s former marketing partner was unreliable. They left critical marketing tasks undone and created unnecessary high-barriers that made doing business with Pro-Tek™ difficult, costing them hefty revenue losses. On top of that, their e-commerce site lacked structure, reporting, and revenue tracking. Our mission? Triage their current situation, stop the bleeding, and get them back to making money fast. Rich and his team are the BEST! It has been nothing but a positive experience working with this extremely professional team of near geniuses. We never had this kind of great information with our last developer, it is amazing to be able to see and take part in every decision that is being made. Best decision that we made was having this company as our developer. 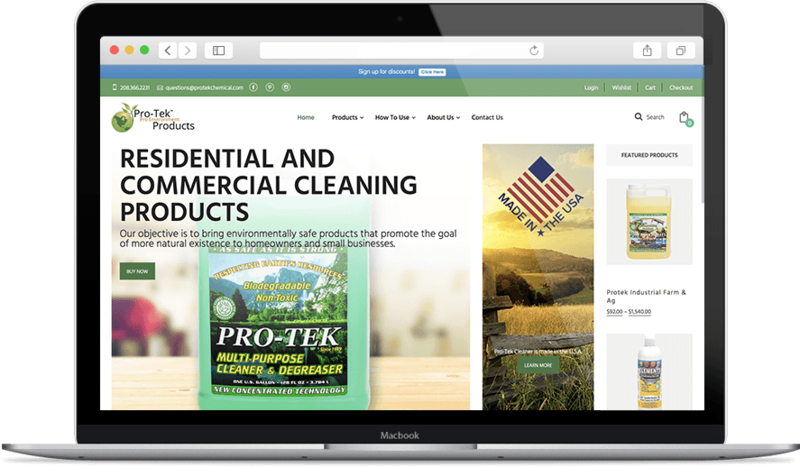 It was imperative that Pro-Tek’s website utilize analytics, testing, and have a slick UX to create a superb buying experience. We designed their website, improved their copy, and ran several A/B and multivariate tests to allow them to quickly rise to the top. We utilized a robust marketing automation platform to sell, cross-sell and communicate with prospective and current customers all night long, so Pro-Tek™ could wake up to the smell of fresh orders. We implemented SKU and Bestseller tracking to improve sales and revenue reporting. To further increase revenue, we managed several Facebook campaigns to retarget their prospects and customers. A clean website and sustainable marketing system that gets actionable data for smart business decisions and supports sale and revenue creation. The Facebook channel and email marketing automation has increased organic traffic and sales conversions. Through reputation management, Pro-Tek’s 5-star ratings and reviews continue to increase. We helped them. We can help you. Let’s Talk – Then Do.